The currency of China is the Yuan and they are devaluing this currency. What the heck does this mean? Well, without telling you HOW they devalue their currency, let's look at what they do. The Chinese are bringing the value down as compared to the Dollar (and maybe other countries currencies as well). The bottom line is that with a weak Yuan and a strong Dollar, China can export more goods cheaper than with a strong Yuan and their imported goods from America are more costly for the Chinese people. That's good for Chinese consumers because Chinese goods are cheaper than American goods. But, this is bad for American exporters. It's one way to get the Chinese manufacturing selling more goods and keeping more money with Chinese consumers because the cost of imported goods is more expensive. Does this make sense? Many American business men are not very smart about currency fluctuations and they sometimes take a beating for their ignorance. On another note, if the Chinese continue to devalue their Yuan more in the near future, the Fed will not be making an interest rate increase as planned. But, if the Chinese hold the rein on their falling Yuan, expect to see the Fed increase interest rates by a quarter per cent. You can expect to pay less for gas at the pump (because of crude oil prices remaining low) but pay more for manufactured goods and services. Stay tuned for more info. Your comments are encouraged. I'm certainly not a genius on these issues by any means and so - give me some feedback or questions. I'll try to help. The Kiplinger Letter recently wrote that " .... we see the economy improving in the second half of 2015, led by stronger spending by consumers and a strengthening housing recovery. And inflation will remain well under control." Consumers drive the economy. They will come on stronger this year. The housing sector is another driver. It is and has been in recovery. You don't have to be a rocket scientist to know that this means more freight. More freight means more need to move that freight. More need to move that freight means opportunity for freight brokers. Yes, less than two years to figure out not only what's going on but what you're going to do about it. I'm talking about the Presidential elections and the opposing forces that are digging in. Despite my innate upbeat outlook on life including the future of the world, there is lurking some pretty ugly stuff. To be specific: new laws related to Obamacare and the envoronment will start to roll out, hitting both business and the general public. No one - at least those of the general public - knows how devastating the impact will be financially, primarily, on the middle class. Funds will move from one set of people to another. I'm not talking about taking from the rich and giving to the poor. I'm talking about losses that will impact the middle class to be passed on to others in the middle class, the lower class as well as the upper class. We are going to be hearing a lot more about this class struggle. And, it's a shame because many in the lower class eventually move on up while others in the upper or middle classes move downward. It's all very fluid. Remember, if it's free, it was taken from someone else. The government is only as rich as what they take from YOU and ME. These new laws (Obamacare and the environment) will cause a cut back on capital investment. Job creation has been exaggerated in the past and it will get worse because businesses will be paying for these new governmental regulations rather than for job creation. Currently, the government is reporting about the lower unemployment rate. They do not, however, factor in those who are not participating in the job market. Job participation is at the lowest since the 70's. This means that the real unemployment rate is about 11%. Then, many of those who are employed will be getting cut back to 30 hours per week. Can you blame a small business owner? I can't. I'm just spouting off here a couple of things that bother me immensely. I'm trying to learn all I can from reliable sources and I'll be taking some action well before the elections. Conservative proponents have long argued for lower taxes both individual and corporate. They argue that good things happen when taxes are lower. Others see individuals and corporations as ready and ripe sources for gathering money - billions of dollars every year. My home state, Texas, does not have a state income tax for individuals. I'm not entirely sure about business taxes but, I think, only those companies making big bucks are paying taxes. Proponents of less taxes are pointing out how Texas has prospered. It has one of the lowest unemployment rates as well and is a haven for entrepreneurs. Then, look at Kansas. Several years ago they implemented a very strict, cut-spending program along with tax reform. It was wretching for some. Others thought it would be the end of the world. Yet, Kansas is making gigantic strides forward in areas of low unemployment and more spendable income, etc. Several economists have studied the effect of lower taxes and have said, "every measure of economic prosperity is linked to taxation". Let's keep an eye out on Kansas and other states that are pushing for lower taxes. It appears that people want more spendable income in their pockets instead of forking it over to the government. This is the way it should be. Texas is oil and gas rich. No doubt about it. Most other states are not so fortunate. The population of Texas is expected to double by 2050. This means preparing infrastructure to accomodate the growth and wear and tear on our highways. It appears that the state will be taxing oil and gas revenues to help fund this increasing demand for more and better infrastructure. What is YOUR state doing to take care of it's highways and by ways? Do you have any input? Let's hear from you. Just make a comment below. Are you on the fence post? 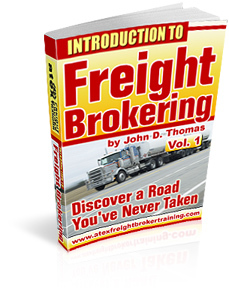 Thinking about getting into freight brokering but just been sitting there? Don't put this off while others are getting in line in front of you. The economy grew at a 4% rate for the second quarter and at least a 3% growth is projected for the last half of the year. Folks, this ain't chicken feed. There's going to be more demand for business and consumer products. You can be a part of all this if you act now. Why? Why are companies leaving the US and going over seas (Pfizer, Mylan, Walgreens, and others)? The simple answer is because the US has the highest corporate income tax rate than any industrialized country in the world. There is a solution for keeping companies here. It's cutting the corporate tax rate while at the same time taking some of the loopholes away that favor the very wealthy. Why isn't this being done? Because it's "political". Sadly, not too many politicians in Washington want to take loopholes away because it might come back and hurt their support or contributions. Also, once loopholes start getting plugged, it may attract those that want to vilify the "rich". They don't know that by vilifying the "rich" they induce others to start vilifying hard-working business owners that may not be as rich as one might think. Business owners, after paying employee salaries, a portion of their social security, medicare, vacation, medical and other employee benefits in addition to paying all other business expenses like rent, equipment, inventory, utilities, office expense, advertising and on and on ..... these business owners may not be the villains they are sometimes made out to be. Congress - get your act together and lower corporate income taxes. Bring it down to around 25% as a start instead of the outrageous 35%. What's going on here? Pedicures and help wanted signs? Today, I went for my usual pedicure. Yes, it's great. If you haven't tried one, do it soon. So, what was different today? Well, after I was seated and being treated, there was an influx of customers like I have never seen before in that place. I have been going there for over five years. The place was getting packed with some getting nails done and others getting a pedicure. Then as I was driving around today, I saw three Help Wanted signs outside of several retail or restaurant stores. Normally I don't see that. Here are my thoughts. I truly believe the economy is gaining steam but not necessarily due to anything this administration is doing. At some point, pent up demand has to explode. Remember, down here in El Paso we did not experience a wicked winter. We get temperatures in the 60s and 70s throughout the winter. We do not have snow, of course (sometimes we do). So, it is business as usual during the winter months. So, what's going on here. Again, the economy is picking up steam and has been for some time in this area and other areas too. I will wait and see how the stats come out in July for the second quarter (Apr, May, Jun) to see if indeed things have been jumping. And I'll be just as anxious to see what the stats are in October for the third quarter (Jul, Aug, Sept). I hope things are picking up for you. Maybe it's time to get into freight brokering. Truck sales are on the rise. This is good because you can usually always find cargo. Economists say that housing, especially new construction, is the main driver for keeping our economy strong or getting it going if it's weak. Here in El Paso, things are going well thanks to Ft. Bliss, new medical and educational facilities and the spin-off smaller businesses that result. Did anybody see these coming ..... ????? The other day as I was checking out at a major retail store, they had added SIX automatic checkout stations making a total of ten. Will they make it TWENTY in the not-so-distant future? This is one of the unintended consequences of hiking the minimum wage. Higher wages are good but there are always consequences. Then I heard on the radio that Toyota, after 57 years, is moving their headquarters from California to Texas. California is driving people and businesses right to the right states. California is beautiful and the people are wonderful. But the increasing difficulty to do business in CA is taking its toll on the state budget. And Texas with its business environment is like a magnet, attracting more and more business.